Since time immemorial the Spires have sheltered humanity, towering for miles over the mist-shrouded surface of the world. Within their halls aristocratic houses have ruled for generations, developing scientific marvels, fostering trade alliances, and building fleets of airships to keep the peace. Captain Grimm commands the merchant ship Predator. Fiercely loyal to Spire Albion, he has taken their side in the cold war with Spire Aurora, disrupting the enemy's shipping lines by attacking their cargo vessels. But when the Predator is severely damaged in combat, leaving captain and crew grounded, Grimm is offered a proposition from the Spirearch of Albion - to join a team of agents on a vital mission in exchange for fully restoring Predator to its fighting glory. When will the next book be?! The narration of this book was excellent! I got chills from the reading, very good performance. Highly recommended if you're a fan of Jim Butcher or the sci-fi/fantasy genre. Very good, exciting, interesting. Characters are lovable and have depth, can't wait to read the next one. Steampunk seems to be the latest trending term devising the name from a blending of sci-fi and fantasy with technology and aesthetic design inspired by 19th-century industrial steam-powered machinery and the cyber punk genre. 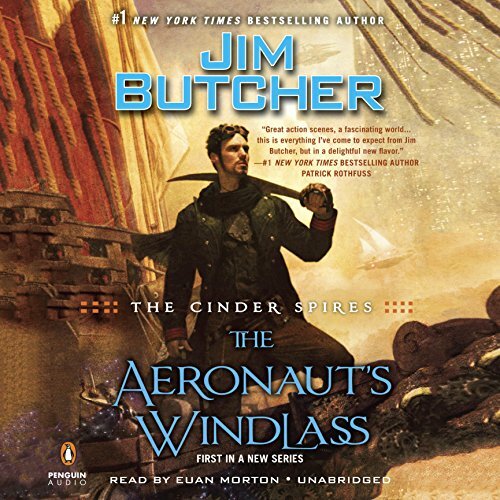 The first book, “The Aeronaut’s Windlass,” is rich in Old World aristocratic political structures known as Spires, vintage clothing,” blended with magnificent airships, (reminding me of the airships in the “Grimm Noir” trilogy by Larry Correa) contesting in aerial naval battles, and other typical noir references usually associated with steampunk. The plot moves quickly and Mr. Butcher introduces many characters and multiple action scenes that, at first seem distracting but soon become distinguishable and fit the story well. Bridget, scion of a once-prominent noble house on the verge of ruin and her cat, Rowl, Highborn Gwendolyn Lancaster, her “warrior born” cousin, Benedict; the grizzled Captain Grimm; and master etherealist Ferus and his assistant, Folly are a motley group of disgraced veterans and novices that are sent off to stop the mysterious force behind a very coordinated and deadly series of attacks on Spire Albion by its rival, Spire Aurora. There is plenty of action and the society is open for some political backstabbing. I always think that it is a good book when you wonder what is going to happen next. Jim Butcher's long awaited foray into steampunk lives up to every possible expectation, and they were high. I'm a big fan of the Dresden Files and if possible, enjoyed Codex Alera even more. The world of The Aeronaut's Windlass is entirely different; mankind lives in tall spire cities, away from the dangerous surface of the earth. Peopled by monsters, the surface is to be avoided at all cost. The Spire Cities, Albion and Aurora, are fiercely competitive with a history of warfare. A new round of warfare, initiated by Aurora, is the focus of The Aeronaut's Windlass. Aurora is clearly willing to use whatever means necessary to destroy Albion. Captain Francis Grimm is loyal to Spire Albion, despite having been treated badly by the Admiralty; drummed out for cowardice unjustly. After his privateer airship, HMS Predator, is badly damaged in an Auroran ambush he must limp home for major repairs. He is recruited for a mission by the Spirearch with the promise of repairs and new crystals for The Predator. He will be aided in his mission by a motley crew of characters ranging from the admirable to the just plain strange. He is also up against a female adversary who rivals Queen Mab of The Dresden Files and the Vord Queen of Codex Alera for sheer evil. The action of the book is relentless with the characters jumping from frying pan to fire nonstop. I waffled about the rating on The Aeronaut's Windlass. The world building was almost too organic in that you are thrown into the action with no foundation. I don't mind saying that I had difficulty forming a mental picture of the Spires and airships, at least at the beginning. Euan Morton's narration pushed it from a 4.5 to a 5 for me. I was glued to my device until I realized there is actually no good stopping point in the action. His portrayal of Rowl, Prince of the Silent Paws is spot-on. I highly recommend The Aeronaut's Windlass. Really very well written and creative story, leading to more down the road I would expect, as not all of the loose ands are wrapped up at the end. Good and satisfying ending, but new questions arise by the end that will lead well into future books. Narration was top notch and well done- a good narrator can add a whole additional layer to the story, which is what happens here. The characters are fairly interesting, if a but stereotypical in nature, perhaps to some of the story's detriment. Having a strict, honorable, "privateer" Captain who just happens to have the last name of "Grimm" seems a bit much to swallow in one sense. But just get over it, because it feels right for the story going on here too. The author, while perhaps being a bit dramatic with the naming, still nails his characters pretty well in how they act and feel. There isn't much in the way of moral ambiguity here- honorable people are incredibly so, evil people are diabolical with no redeemable qualities or backstory to support why they turned out that way. But despite the lack of levels of gray between the back and the white, the story told here is still quite well told, dramatic and engaging, and holds your interest MOSTLY. I emphasize the "mostly" because I did find my mind wandering a bit during some of (what I assume was meant to be) the more dramatic action sequences and battles. Not that they weren't interesting, but they tended to be a bit verbose. That may be more a fault of the listener and things I had going on while listening instead of the story though, so your mileage may vary with regard to that criticism. Still, I was pleasantly surprised with this particular book, and enjoyed it throughly. I look forward to more in the series and will definitely keep on listening. Well worth the credit! What made the experience of listening to The Aeronaut's Windlass the most enjoyable? I really enjoy Jim Butcher's writing style, he can actually make me laugh out loud and the performance by Euan Morton was incredible, hope he has the gig for the next instalment. I realize there is a lot to establish in a first book when you're planning a series, but this was a LOT to keep in my head. Two things made it difficult for me, personally: The first person point of view kept changing which required mental adjustment while still attempting to follow a new storyline; The cast of characters are just a few too numerous. I can begin to understand the reasons for all of these choices, and I can see as the series unfolds it will become easier to follow these characters within the larger story arch. It just makes this a bit of a slog for book 1 in the series. I've had to re-listen or re-read a number of passages because I lost the thread. I hope books to come make this first book pay off. Best Butcher Ever! Best sci-fi fantasy of 2015! Great ensemble cast with strong warrior women and men, wonderful ethereal beings, and evolved cats personalities. I liked the fast pace. I very much enjoyed the strong characters any one of whom could be their own book. And one just has to love the cats. What about Euan Morton’s performance did you like? His performance was absolutely amazing and spot on. He made it easy to distinguish between characters. Mr. Morton is very easy on the ears. I didn't want any of my favorite characters to die. I absolutely did not want the story to end and I think Jim Butcher should be sequestered and not allowed to rest his pen until the sequel is in the hands of his publishers. I am excited about this new series. However, I hope we haven't heard the last of Senior Dresden. The narrator is excellent. I look forward to listening to other books he has done. What other book might you compare The Aeronaut's Windlass to and why? It's definitely an adventure with lots of battles. There wasn't much time to catch one's breath. I would say it's a lot like Star Wars in comparison. Like other wonderful audio books, a great narration brings the book to life in ways that are different from just reading the words. Characters personality and traits are expressed and become almost tangible. I haven't read much Steampunk so it's hard to compare it to anything in that genre, but I will look forward to readying the the sequels. And I LOVED the cats! I have 4 myself and I believe Jim's characterization of them was spot on! Sorry, but I just did not find the descriptives clear enough for my more literal brain. I mean, I like steampunk (Chasing the Green Fairy, the Chronicles of St Mary's, Parasol Protectorate, etc), but this just didn't work for me. The plot was ok, but I couldn't seem to get engaged. The best of it was Euan Morton's performance. He was able to individualize the characters and is endowed with a very pleasant voice. What did you love best about The Aeronaut's Windlass? What was one of the most memorable moments of The Aeronaut's Windlass? Thee are so many,because the book is nonstop action. All of them Euan Morton is a great narrator, wish he would narrate more books.